Ride with your friends? This beautifully hand-crafted pewter Paceline Bicycle Ornament with both male and female cyclists, will make an elegant addition to your holiday tree or a great gift for your favorite cyclist! Designed by artist and cyclist, Dana Paige. 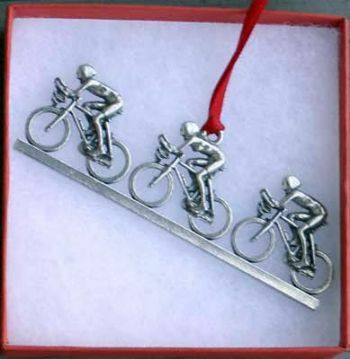 Actual size of pewter ornament is 4" x 1"